iTech‘s secure and Web-based expEDIum Ambulance/EMS Billing Software is designed to eliminate EMS billing errors and get the claims paid faster. Every claim gets into the system, which are validated for errors using several customizable rules and passes only clean claims to Payers or Clearinghouse. This service is flexible, comprehensive, easy to use and automates the complete billing workflow and provides excellent support that helps to save tremendous amount of time and cost. Hence, it gives a good value and a perfect solution to Ambulance/EMS Agencies and EMS Billing Service companies. This cloud based solution is ICD-10 ready and available in monthly subscription. The expEDIum Ambulance Billing Software has capability to manage the database of the Healthcare or Medical facilities that is used by Ambulance Agencies. This software provides more flexible, less time in getting accurate data by allowing users to choose the sources and destination of the transport at claims level as well as service line level from a special screen. Solution also handles contracted payers/facilities billing efficiently. 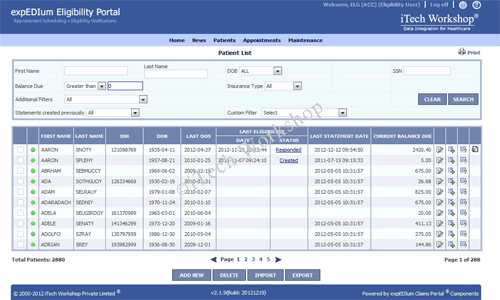 This Solution has several inbuilt reports including Ambulance/EMS Billing specific reports. Advanced Life Support (ALS) and Basic Life Support (BLS) report generated based on ambulance specific procedure codes and the solution has the capability to determine whether a code is ALS, BLS or Both. The report shows service lines of posted claims which has these ambulance specific procedure codes, their payment amount and percentage of the payment etc. This Solution allows the reports to be exported to the excel or pdf formats. There are over 60 in-built reports available in addition to several customizable dashboards.